NEW BEDFORD, Mass. — In 2007, Southcoast Health embarked on a new way to provide inpatient care, becoming a pioneer in implementing a Hospitalist Program model that has dramatically changed the way patients and family experience a hospital stay. 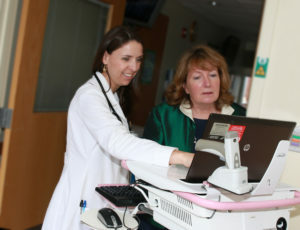 Today, St. Luke’s Hospital in New Bedford, Charlton Memorial Hospital in Fall River and Tobey Hospital in Wareham are staffed by more than 60 hospitalists who are board certified in Internal Medicine or Family Practice. 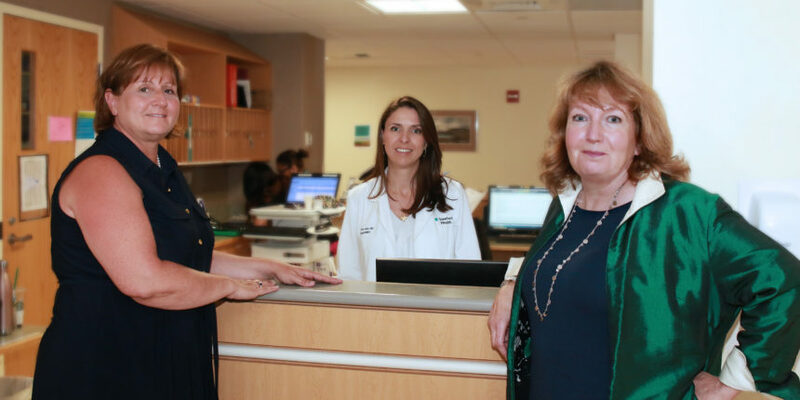 Southcoast Health Medicine Care Center Executive Director Kelly Roderick said the use of hospitalists is a way of caring for patients that has gone from rare and sometimes controversial a decade ago, to an accepted best-practice at larger hospitals across the country. Southcoast Health Hospitalist Dr. Ana Laus (left) with Southcoast Health Patient Ambassador Patricia Mangan-Ball. Each day, Southcoast Health hospitalists provide medical care to 300 patients across the three campuses. That care is 24 hours a day, seven days a week. When Southcoast Health began its Hospitalist Program, there were approximately 1,000 hospitalists nationwide. Now, that number is approaching 44,000, according to the Society of Hospital Medicine. In fact, the American Association of Medical Colleges says the specialty is one of the fastest growing in American medical schools. In a recent publication, the United States Department of Labor noted the key attributes of doctors in the hospitalist role are sound decision-making, excellent communication skills, and a sympathetic bedside manner. Technological developments – especially the adoption of the Epic electronic medical records system – have allowed hospitalists and primary care physicians to stay in constant contact about the conditions, treatments and prescriptions for patients. And the availability of a physician in the hospital 24/7 means families have a chance to talk with doctors about patients throughout the day and week. Patient Ambassador Mangan-Ball agrees that most patients feel the round-the-clock medical care is crucial – but so is the regular family contact. Dr. Laus said increasingly physicians deciding on a specialty are drawn to becoming hospitalists. And Dr. Laus said despite long hours – 12 hour days for seven days straight, then seven days off – doctors thrive on the environment. “I like the setting – I like the fast pace of a hospital,” she said. According to a study by Medicare, hospitalists are succeeding in the most important area of all: A wide-ranging 2012 study that hospitals with hospitalists on board had higher patient satisfaction than those without.